Our second CI Workshop of the year! Email contact@earthdance.net with any questions. Lani Nahele, (aka Lisa Schmidt) B.F.A. SUNY Purchase. Trisha Brown Dance Company 1985-1992. A dancer, movement educator, bodyworker and mother. She is a Practitioner of Body-Mind Centering and is certified in Gyrotonic, Gyrokinesis, Pilates, Circulatory Massage, Reiki, and Infinity Healing. Her private practice, Embodied Healing, guides toward reclaiming vitality and full functioning in a healed and actualized body. 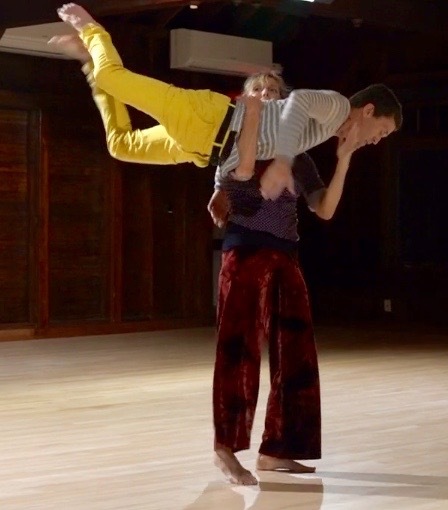 She is a seasoned teacher of Contact Improvisation and Modern Dance, a professor at Springfield College, Director of Studio rEvolution in Florence, creator of LaniPants and mother to Willem. She teaches with joy and a value of inclusion.